I have decided that, even though the majority of the trip will only have myself in the vehicle, I would like to keep 4 seats. This will allow for visitors and so I am kitting out with basic equipment for 4. This is in regard of cooking and sleeping although I will probably only take 2 chairs and the other 2 can use storage boxes with some sort of cushion. 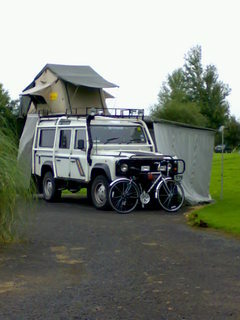 I will take a light tent for the extra people and I have an Eezi-Awn tent on the roof for my normal accommodation. A few years ago I purchased 2 of the military sets that are made up of two 5l jerry cans and a cleaning kit all locked together in a tray. I intend taking these as I can have one jerry with EP90, one with ATF, one with top-up engine oil and another available for whatever I choose. One of the cleaning kits has long since been discarded and the container houses my locking wheel nut key, a few spanners and my hub spanner. 2 water jerry cans and 2 fuel jerry cans will also be stored here. Above this level I will fit a shelf and this will be where most of the stuff in Pelican cases will be stored along with bags for clothing and the like. I am a great fan of the work done by Mobile Storage Systems. Some people complain about the cost but I have yet to see any other equipment which has the same build quality. In my 109 hardtop I had a Store Drawer, a Store Chest and a one off filler unit which was mainly a frame and lids. These 3 items with the filler in the middle made a complete flat loadbed between the seat boxes. To keep the seating options for the Station Wagon I have done away with the filler which is available for purchase from Footloose 4x4. I intend to put things like spares and items I wont need very often in the Store Chest. The cooking gear and some tools will go in the store drawer. On the back door I will carry my cooker in a Mobile Storage Systems housing and have made a purpose built cupboard for the coffee items and another for the water filter housing. The filtered water tap is mounted on top of the spacer that is used with the cooker housing when you have a rear wiper motor. I was lucky enough to purchase 4 aluminium Zarges boxes at £30 each making them only slightly more expensive than Wolf boxes. Combining this with the ability to use 2 with a sand ladder as a table and 1 to sit on at a useable height made the decision for me. I have Pelican cases for all my dust sensitive equipment but will keep the number down as they are quite heavy. Peter at Trevor Sales Cases provided a decent alternative for my laptop made by Seahorse. I have a set of security screens on the rear windows and also on the rear side sliding windows. 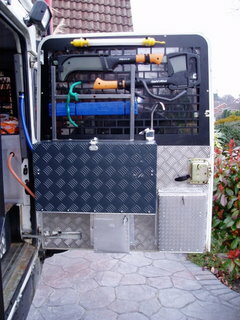 This combines with a load guard to provide a secure rear section to the vehicle. I will be adding a lockable hasp to the rear door to assist in this. I have built a compartment for the gas bottles and another for the water pump. This will be described in the section on fuel and water storage. As far as security boxes go I will just say I have that covered and I wish to keep the details of how many and where under wraps as I need to get into the habit of considering security. I will put up pictures of my storage system as it gets settled and will put it on test this Summer. Just put in an aluminium bulkhead as a load guard. I will fit a blanking panel to complete this in the next few days. This will be removable but not from the passenger side. I have added a shelf attached to this bulkhead and the rear headrests are fixed along with a few other bits and pieces.